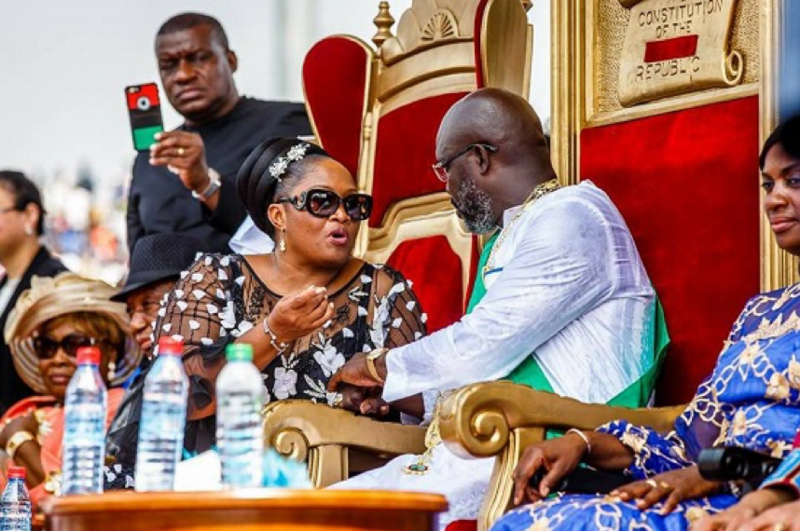 Monrovia – President George Manneh Weah and his second-in-command, Vice President Jewel Howard Taylor have finally put the ‘bad blood’ behind and have smoked a peace pipe, according to a cogent source. A source who was privy to the discussions in the ruling Coalition’s Governance Council’s first Meeting, told FrontPageAfrica that the Meeting focused mainly on internal unity of the ruling party — Coalition for Democratic Change (CDC). Our source further divulged that in this Governance Council Meeting, which was the first of its kind, as a part of the internal unity, every attention gazed at the VP’s relationship with President Weah. “Almost all Members of the Governing Council put her in the spot as acting contrary on many fronts. Most of the issues she had raised were non-substantial and immaterial to facts and were thrown out as baseless,” our source stressed about what had happened behind closed door at the Congress for Democratic Change party headquarters in Congotown. The strains were even more visible when aides to the President reportedly sought to keep Madam Taylor from presiding over the Senate in a bid to limit her leverage and influence. “They told some of us that they did not want Jewel to preside because it would have given her a leverage,” a senior member of the Senate had told FrontPageAfrica, on condition of anonymity. The VP was reportedly summoned by the President Pro Temp Albert Chie, who attempted to suggest that the Vice President should not preside. The push against the Vice President presiding was reportedly backed by Senator Varney Sherman (UP, Grand Cape Mount) and the Pro Temp Chie. “At the end of the day, they realized that constitutionally the woman had the mandate. But this was a serious issue that triggered intense argument amongst senators,” the source added. The issue was compounded when the Vice President took to the airwaves to publicly apologize to the President over her failure to notify him prior to making foreign travels. VP Taylor called for compassion and apologized for her error in judgment. From than onward, it seems the strain was still between the pair but the Governance Council Meeting now seems to have acted as the “blood of Jesus”, which washes all sins away. According to our source, the Council’s First Meeting also touched on the two pending by-elections in Montserrado and how the ruling Coalition can field formidable candidates to fill the void created in the 54th Legislature. The voids were created by the passing of Senator Geraldine Doe Sheriff and Representative Adolph Lawrence both of Monsterrado County. He disclosed that the Chair of the Coalition, Mulbah Morlu, was instructed to open up applications from aspirants for a free, fair and transparent primary. According to him, the Council concluded that the party most likely carries a female partisan in accordance with the party’s 30 percent gender quota representation in its structure. “We also talked about the 2020 Senatorial election elections. The party discussed an early preparation plan and discussed strong urge to present the best candidates,” our source further disclosed. According to this source, on the reported Cabinet shakeup, the President said he would hold such sensitive conversation in Cabinet meeting. “The meeting also acknowledged some challenges in the economy and the President promised to continue ongoing efforts to stabilize the economy and create a boom,” this impeccable source hinted. According to our source, the Meeting was in two segments and the first, which was not the main Council Meeting, included the Coalition Members and leaders of collaborating political parties. Both segments were chaired by the President.